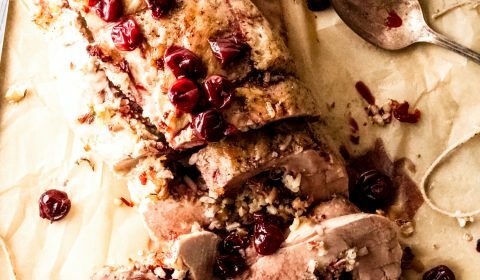 This stuffed pork loin with cherry port sauce is perfect for a cozy night’s dinner or a small family holiday dinner. Using a sharp knife, butterfly or roll-cut the pork tenderloin until it can be spread out and laid flat. Use the flat side of a meat mallet to flatten the meat until it’s a uniform 1/2-3/4 inch in thickness. Season with salt and pepper and set aside. In a large pot, add the rice and chicken stock and bring to a boil. Cover and reduce to simmer. Simmer about 15 minutes or until all liquid is absorbed. Remove from heat and fluff, then set aside. In a large skillet, melt the butter. Add the chopped onion, celery, garlic and seasonings. Cook until the celery and onion have softened. Next, add in the dried cherries and cook for another 5 minutes. Lastly, add in the cooked wild rice and stir to combine. Remove from heat and let cool about 5 minutes. Spread the wild rice stuffing over the pork tenderloin. (You will have stuffing leftover, reserve for serving with the stuffed pork tenderloin.) Begin to roll the pork tenderloin, keeping it as tight as possible. Tightly truss the pork tenderloin with cotton string or twine, then place into a roasting pan, seam side down. Roast for 30-40 minutes or until the internal temperature reaches 145 degrees F.
While the pork tenderloin is roasting, begin making your cherry port sauce. In a medium-sized saucepan, combine the cherry port sauce ingredients and bring to a boil. Once boiling, let it reduce to about half, then remove from heat and let it thicken as it cools. Once the stuffed pork tenderloin has reached its internal temperature of 145 degrees F., remove from oven and let rest for 5-10 minutes. Slice and serve with additional wild rice stuffing and the cherry port sauce.